If you need an alternative to a portable air conditioner that is without an exhaust hose to keep cool, an evaporative cooler makes a good replacement in the right climate conditions. Yet many people are unsure about the difference between the two types of air cooling device and which is best for their personal situations. I created this article to explain what the differences are and where this type of cooler makes the best option for a climate maintained home or workplace. First of all, I'll explain what this kind of device is and then I'll compare it with an air conditioner so you can see how the two differ. I'm sure you've had the experience of going to the hardware store or looking at stores online for a portable, compact and free standing unit that will cool you down in your home or workplace during the hot days (and nights ) of summer. Once you're there, you were doubtless confronted by a collection of white or silver plastic units in the air cooler section that all look pretty much the same at first glance. While they may all look very similar and do a similar job of blasting out cold air, there are some big differences under the hood that you need to know about before you make your decision and buy. There is a large reservoir tank in the base that holds water that you will need to add before you can use the machine. Above the tank is a large area of porous, absorptive material stretched over a frame standing vertically and connected to the tank by a filament of the same porous, absorptive material. In front of the frame is a regular fan. Some larger units also incorporate a water pump to force more water into the porous material to keep it wet, although with smaller units this is not necessary. At the top, you'll find the controls which generally include an on/off switch, fan speed setting, oscillation setting and a timer. Most modern devices come with a remote control. When moisture covers the surface of an area of a material like skin, it absorbs the heat. When a breeze evaporates that moisture, the heat is taken away from the surface as the moisture is carried away as water vapor by the breeze which feels cooler. A good way to see this in action for yourself is to take a glass of cool water and blow into it as hard as you can. The air that comes back onto your face feels cold, doesn't it? Take that same process and apply it to a stretched membrane of porous material that is made wet, as in our swamp cooler. The fan draws warm air from the room into the unit, through the membrane and transfers the heat to the moisture, which is expelled as chilled air out the front of the unit, which cools the air in the room! That's basically how it works (without going into reams of boring scientific explanations). 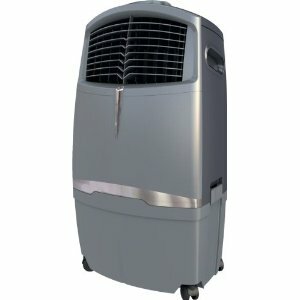 How Does an Evaporative Cooler Compare with an Air Conditioner? There is a big difference in the way the two devices work. As you probably can already guess from what is happening inside a swamp cooler, there is very little in the way of energy consuming motorization. In fact the only real energy draw is the fan. The kind of fan you typically find inside a swamp cooler will use maybe 100 watts of energy, give or take a few watts. Remember that, because it's important! An air conditioning unit chills the air it expels by passing room temperature air through a heat exchange process that works in a very similar way your domestic refrigerator in the kitchen does. Without going into too much boring detail, the refrigeration process involves compressing a refrigerant gas inside the unit's motor which chills it a lot. That gas gets forced through a lattice of thin pipes like a kind of radiator and the air that is passed through that gets chilled. Air conditioners have a major downside in that a part of the heat exchange process involves the production of slightly more hot air than cold. The hot air is separated from the cold and vented from the unit to the outside of the building through a vent hose. I'm sure you've seen one and maybe even experienced the problems trying to hand the hose out a nearby window, then try to block it up so the hot air doesn't come right back into the room! They have another major downside because all that motorization happening under its hood uses a lot of electricity. A typical portable air conditioner will use upwards of 1,000 watts and often 2-3,000 watts of energy to keep you cool, depending on its size and the volume of space it has to cool. Swamp coolers may have the upper hand in that they don't vent any hot air and therefore don't need a hose plus they use around 1/20 the energy to keep you cool. But they have one disadvantage that I need to tell you about here. Because the way they work involves evaporating moisture into the air to chill it, you will get to a point where the air becomes saturated with moisture and the cooling effect starts to diminish. If you already live in an area that has high humidity (lots of moisture in the air) a swamp cooler is much less effective and may not work at all at humidity levels of over 60% or higher.